The Yale men’s basketball team, facing controversy over various public displays of support for expelled team captain Jack Montague, has signaled a continuation of that support following their win against Columbia on Saturday. 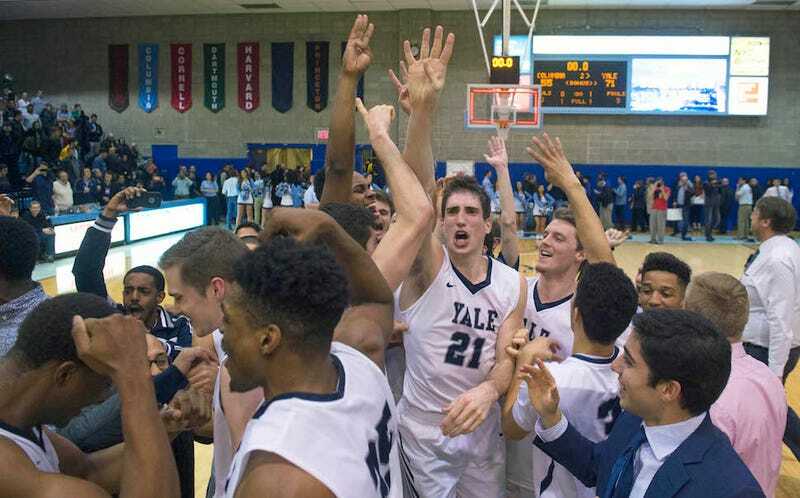 In the moments following Yale’s win, which clinched the team’s N.C.A.A. bid, the Yale Daily News reports that members of the team raised four fingers to signal Montague’s jersey number. Guard Khaliq Ghani also reportedly had Montague’s nickname, “Gucci,” written on his wrist tape during the game. Members of the team have expressed their seemingly unwavering loyalty in response to the departure of their captain, whose expulsion—recently confirmed by his father—has not been and likely will not be explained by the university (Yale has cited the Family Educational Rights and Privacy Act). The shirts did, in fact, “make it as clear as possible that Jack is one of [their] brothers,” as senior forward Justin Sears told the YDN. It’s just that their expression of brotherhood is incompatible with a campus climate in which everyone can feel safe. The basketball team, or any varsity team for that matter, stands in a particularly privileged position; inherently, some voices will be heard louder than others. There is a power in the scope of their public reach that can also be a burden. Jezebel has so far been unable to independently verify the existence of any official sexual assault complaints against Jack Montague, and a New Haven police spokesman told SI on Friday that neither Yale nor the New Haven Police Department are investigating any sexual assault claims against Montague. Several students in correspondence with Jezebel have repeated the allegations originally seen on the posters without being able to confirm them. A source on campus who described himself as close to the team, speaking anonymously, told Jezebel that a sexual assault claim was made against Montague. In various interviews with Jezebel, students have mentioned that in their experience, Yale rarely expels students, and underlined the significance that context lends to Montague’s expulsion. When reached for comment on Yale’s expulsion record, Yale press secretary Tom Conroy responded with a link to past UWC reports. According to the YDN, Yale’s Undergraduate Regulations detail that an expulsion can either be imposed by the Yale College Executive Committee (ExComm) or recommended by the University-Wide Committee on Sexual Misconduct (UWC). According to Yale’s fall semester sexual misconduct report, released on February 15, none of the 34 sexual misconduct complaints against undergraduate students between July and December 2015 have thus far resulted in expulsion (many cases are still pending). In a chart labeled “Updates to Previous Complaints”—or complaints originally featured in a previous report—a single respondent was listed as expelled for sexual assault. In the previous report, covering events between January and June 2015, one student was expelled for sexual misconduct. The Executive Committee’s most recent biannual report, released in the spring of 2015, details that there were zero expulsions out of 69 cases. There have been no reports of protests from Yale students at Saturday’s game, but the YDN reports that a Columbia student declared strong views on the matter via red body paint.